…actually kind of cool once you give it a listen. 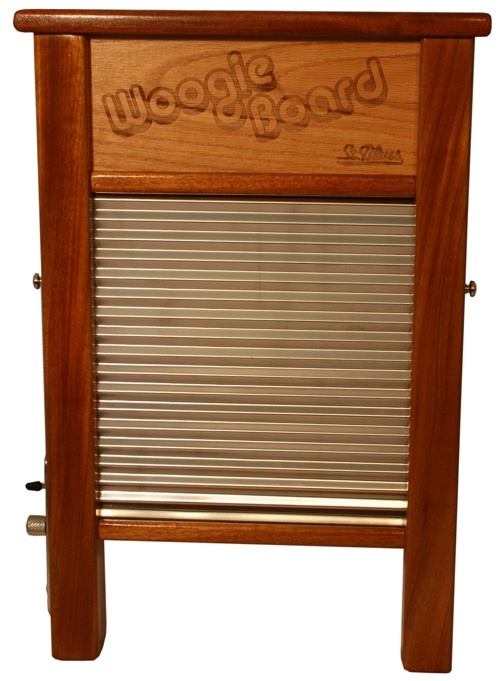 It’s called a Woogie Board, and it’s the world’s first – you got it – electric washboard. Before you laugh in disbelief – I actually couldn’t believe the PR company that sends me press releases on new products would send this out – but this thing is for real. The Woogie Board features a solid mahogany body with dual piezo pickups, a three-way switch, and a Tele control plate, completely handmade by Saint Blues Guitar Workshop in partnership with Cody Dickenson. Sounds like I’m describing a guitar! Ha! But this thing is meant to be plugged into effects boxes like a wah, delay, flange – whatever. And it produces some VERY cool sounds. Check out the Woogie Board video and sound page! Admittedly, something like this really ain’t for me, but if you do roots style music, this could be an instrument that you can add to your sonic arsenal.